Roman was a happy, healthy kindergartener who had never been sick longer than 48 hours in his entire life. That all changed in October 2010. Roman started to have jaw pain one afternoon that continually increased to such a high level that is caused him to cry constantly, even as he slept. The next morning, Roman's mom, Elizabeth, took him immediately to a walk‐in clinic where he was diagnosed with an ear infection and prescribed an antibiotic. "When I picked him up from school, he immediately came home and fell asleep only waking up to move from the bed and the couch and back," said Elizabeth. "After three days, we returned to the clinic where they gave him pain meds and changed his antibiotic. Within 24 hours on the new medication he didn't even wake up long enough to go to the bathroom or get out of bed." Over the course of the next two weeks, Roman's family learned that he had Stage Three Burkitts Lymphoma, a very aggressive form of pediatric cancer. The primary tumor was in Roman's head, measuring almost 7cm, and he also had tumors in his kidneys. "We were so blessed," said Elizabeth. "While the disease had spread quite far, it hadn't infected a large amount of his body or grown through his spinal cord, even though it had grown right next to it." 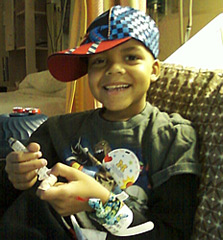 Over the next nine months, Roman underwent rigorous chemotherapy and on June 28, 2011, finally went into remission. Due to the aggressive nature of Roman's cancer, he will be closely monitored over the next five years until he is deemed cancer free. "That day cannot come soon enough," said Elizabeth. "The National Children's Cancer Society has been such a blessing to our family," she continued. "Roman is treated nine hours from home and NCCS has been able to assist us financially as well as provide an amazing online network gives me access to educational information and support systems. However, the most helpful service I have received is knowing I am not alone it this nightmare. NCCS truly understands the struggle and pain... as well as being there to rejoice with me when we get good news such as his remission! Invaluable is how I would describe NCCS services that they offer. Thank you NCCS!"